Home > Resources > Others > How to Fix Samsung Smart Switch Not Working? "Anyone having trouble with Smart Switch? It keeps searching my Samsung S7 up to 98% then give an error message saying the phone was disconnected." Samsung released Galaxy S10 this year and keeps attracting users all over the word. A quiet many of Samsung users may choose Smart Switch to transfer files when switching to a new Samsung Galaxy S10+/ S10/ S10e/ S9. But sometimes, they come across Samsung Smart Switch not working. Considering the amount of Samsung users, this problem may bring large trouble. That is why we post this tutorial to fix the problem. You can read the following text and find at least one practical way to fix the problem easily. Firstly, you need to know that Samsung Smart Switch can not work smoothly on all Android phones and iPhones. This app requires Android 4.0 or later OS for wireless transfer. And if you were iPhone users, it only allows you to transfer limited types of files by its PC version. To use Smart Switch on PC/ Mac, you need to make sure that the device is running Android 4.3 or later/ iOS 4.2.1 or later. Many users find that it is usually crashed when transferring data. When the data you transferring is too large, or you put the source and the target devices in an improper distance, the files may be crashed and the app will transfer the data again. However, the transferred files may get corrupted on your target phone even after transferring again. If you fail to connect the target phone or computer, you need to check your network or USB cable. Please change to another network or USB cable, and put two devices closed to each other during the wireless transfer. It is also a common problem that you can not find your backed up data. In this case, you need check settings or make a new backup again. Space of your phone is not enough? it is time to remove useless files and clear cache, history or cookies on your phone. What's more, you can use Smart Switch to backup data to computer or external memory, such as SD card and USB disks. To fix Samsung Smart Switch not working, you can restart the app on both your devices, or reinstall it on your phone/ computer. If it still does not work, you had better try to find alternative tools to transfer your files. There are many Samsung Smart Switch alternatives on the market. We introduce one of the best on the following text. You can use it to transfer files from an old phone to a new one directly by clicking once. 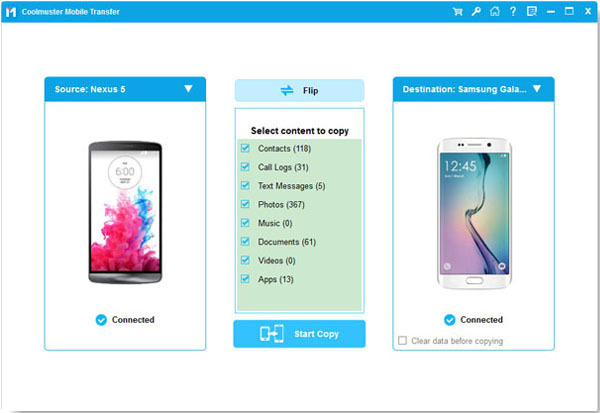 Many users would like to take Samsung Smart Switch mobile app as the first choice to transfer files from one phone to another one directly. If the app can not work, you can use its alternative - Samsung Data Transfer to move data to another phone in batches. Samsung Data Transfer is a professional phone transfer, supporting Android to Android, Android to iOS, iOS to Android and iOS to iOS transferring. Featured with strong compatibility, the software is friendly to almost all Android phones and many iOS devices, such as Samsung Galaxy S10+/ S10/ S10e/ S9/ Note 9/ Note 8/ A9/ A8/ LG/ Huawei/ Sony/ Xiaomi/ Motorola/ iPhone XR/ XS/ 8/ 7/ 6 and more. Android to Android - contacts, call logs, text messages, photos, music, documents, videos, and apps. Android to iOS - contacts and documents. iOS to Android - contacts, text messages, books, music, videos, and photos. iOS to iOS - contacts, notes, calendars, bookmarks, and books. - Great compatibility allows the program to work perfectly on iOS devices and almost all Android devices, the newest Samsung Galaxy S10+/ S10/ S10e are included. And this Smart Switch alternative is compatible with Windows PC and Mac. - Good stability & without data loss. Under the support of professional technology, data transferring by USB cables is stable & smooth. You do not need to worry about the distance of two devices or how large the data for transferring is allowed. The files you transferred will not be corrupted on both your devices. - Support data transferring from Android to Android, Android to iOS, iOS to Android and iOS to iOS directly. - Transfer files within few minutes & 3 steps. You can easily follow the on-screen prompts to transfer files fast. - 100% clean & will not leak out your data. We take Android to Android as example, and you can use other 3 modes similarly. Step 1. Connect your phones to PC. Launch the program on your PC, plug your source phone and target phone to computer via USB cables at the same time. You need to enable USB debugging if it prompts. Step 2. Select files from the source device. Please go with the on-screen prompts to make the program detect your devices. After that, you can see the interface as below. Please make sure that the source phone is on the left and the receiving phone is on the right, otherwise, click Flip to change their sides. Then, you can select the files that you want to transfer to the receiving phone and simply tick the boxes on from the middle panel. Step 3. Start to transfer. 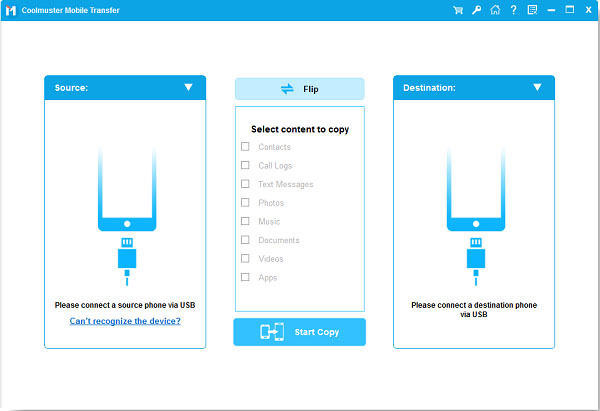 After selecting your wanted files, you can now click Start Copy to activate the data transfer and wait for few minutes to get the transferred files on your target phone. We simply analyze the most common reasons that lead to Samsung Smart Switch not working and give the solutions to fix the problem, including a powerful Samsung Smart Switch alternative software - Samsung Data Transfer. You can pick one to try as you need. But as we know, Samsung Smart Switch not working is a frequent occurrence for quite some users which can not be fixed by simply restarting or reinstalling the app. And Samsung Smart Switch may not work perfectly on other Android phones as it does on Samsung phones. So we advise you to try the professional software to transfer files from your old phone to the new one. 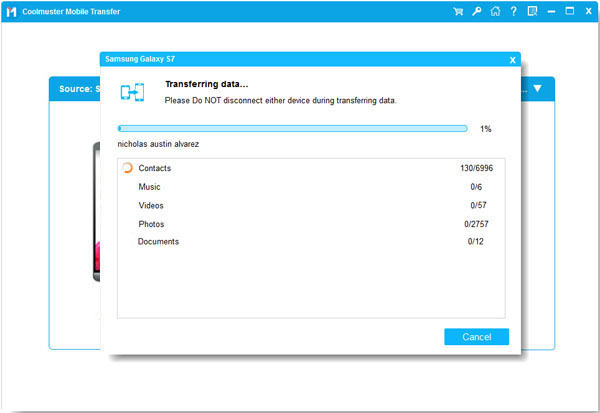 Samsung Data Transfer is a good choice. Why not have a try?